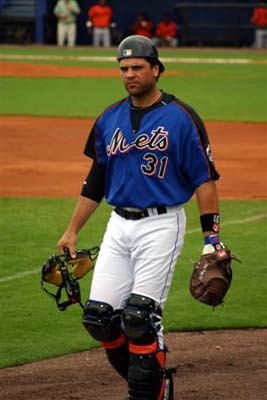 Mike Piazza fell 28 votes shy of being enshrined in Cooperstown this summer. With a stacked ballot that featured three legendary pitchers and a 3,000-hit batter, voters faced difficult decisions on who to vote for and who to exclude. Regardless on the stance of voting for or against alleged PED users, notable names would be left off. Randy Johnson, Pedro Martinez, John Smoltz and Craig Biggio were expected to receive phone calls earlier today, and rightfully so. There’s four. Mike Mussina’s consistent career should garner a look, as should Curt Schilling’s postseason success. Tim Raines is probably the best leadoff hitter whose name isn’t Ricky Henderson. Regardless of anyone’s stance on PEDs, Barry Bonds and Roger Clemens are still some of the greatest players to ever don a baseball jersey. There’s nine. Then there’s Piazza. His credentials did not change on his third-year. He’s the fifth-ranked catcher in JAWS, ahead of Yogi Berra, Bill Dickey, Mickey Cochrane and 10 other Hall-of-Fame catchers. His 427 home runs (first among catchers), 143 OPS+ (first), 1,335 RBIs (fourth) and 59.4 WAR (fourth) did not change between 2013, his first year on the ballot, and now. Piazza’s vote totals rose steadily from 329 in 2013 to 355 in 2014 and 384 this year. For him to receive 28 more next year (assuming the number of voters remains constant, which it likely won’t) is asking a lot. Even Biggio, whose 3,000 hits used to be considered a standard for enshrinement, only received 27 more votes this year. Biggio, last year, fell two votes shy of being in the same class as Greg Maddux, Tom Glavine and Frank Thomas. His entrance into The Hall was clearly inevitable and he received 82.7 percent of the vote this year. A Hall-of-Famer is a Hall-of-Famer at the end of the day, and despite falling short last year, he still embraced the kind words during his interview on MLB Network earlier Tuesday. But the system is flawed, on many counts. Limiting the number of potential Hall-of-Famers per ballot to 10 is absurd. There shouldn’t be a limit, nor should there be a minimum. With the limit, some members of the Baseball Writers’ Association of America had to leave off quality players. The Boston Globe’s Pete Abraham wrote he regretfully left off Biggio after voting for him last year because of other players’ qualifications. More than that, the rationales some writers have for their votes are unjust. Some hold grudges against former players and choose not to vote for them. Others won’t vote for anyone who played during the “Steroid Era” because of the ambiguity of who was and wasn’t clean. There are people who deem “first-ballot Hall-of-Famers” stronger than “other Hall-of-Famers.” Heck, because some players like Babe Ruth and Cy Young weren’t unanimous elections, some writers don’t want one now. Seriously. Given that, it’s evident there will be writers who will continue punish anyone who played in the 2000s, even if there was no PED speculation next to their name. Ken Griffey Jr., one of the finest players in this generation, with no connections to steroids, will be left off some ballots because other writers want to selfishly prove a point. Most writers hide behind anonymity when submitting their ballot, but a significant portion of them are willing to attach their names. Ryan Thibs (@NotMrTibbs) collected 222 of the 549 returned ballots from journalists who made their votes public and posted the results in a Google spreadsheet. Though 40 percent of writers made their ballots public, the mystery of who voted for Darin Erstad remains. Piazza would have received the necessary 75 percent needed for Cooperstown from Thibs’ document, but 65.7 percent of the remaining voters chose to leave Piazza off the ballot. If each ballot was released with the voter’s identification, there would be more transparency in the process. It certainly would allow for the writers to display a heightened sense of validity for their voting methodology in a sport whose integrity was in question over the past decade. The ballot will be less crowded next year. Griffey and Trevor Hoffman seem like the only players making their first appearance on the ballot in 2016 with above-average chances for election, and even then, there are still voters who won’t for Hoffman because he’s a reliever, much as there are writers who left off Edgar Martinez for being a designated hitter. Piazza’s place in Cooperstown is imminent, but it’s a question of when. For Piazza to earn at least 28 more votes next year when writers already cast judgement on any player who played in the Steroid Era is a tall order — possibly more so than being one of the top-hitting catchers who ever played the game.